So, what is there evidence for? 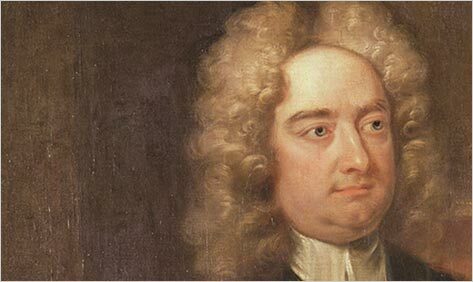 Jonathan Swift was born in Dublin on November 30, 1667, seven months after his father’s death. When he was around one year old, his wet nurse absconded with him, taking him to England and only returning him to Ireland “several years” later — at which point his mother herself left for England, leaving him with his uncle. If all this seems pretty odd, it also may be untrue. There are no baptismal or other records or documents to confirm it. Rather, it is the story that the notoriously evasive and inventive Swift claimed to have been told. Looking into these matters, Damrosch presents various hypotheses offered by earlier inquirers, including those concerning the identity of Swift’s actual father. One of these puts Swift in a close blood relationship to Hester Johnson, or “Stella,” whom he either did or did not marry, and whom he fell out with shortly before her death, possibly because he would not publicly acknowledge the union — if indeed there was one. We do know for certain that Swift went to Trinity College, Dublin, and became a secretary for William Temple, hoping that the influential Tory statesman would further his career in England — either in the church or in politics. No such luck, and Temple was only the first of Swift’s patrons to disappoint him. Swift’s political writing on behalf of the Tories was powerful, but his career was stymied at many junctures thanks to dilatory patrons, the entanglement of many Tories with the exiled Stuarts, the arrival of Whig political dominance with the reign of George I, and his own outrageous publications (notably A Tale of a Tub). He was also a lifelong victim of Ménière’s disease, the resulting vertigo and nausea incapacitating him both physically and mentally for grueling stretches of time. Swift, who had longed for a well-endowed English bishopric, ended up as dean of St. Patrick’s Cathedral in Dublin, where he presided for thirty-two years. There, he became so admired and loved that his (putative) birthday was celebrated every year by a citywide pealing of bells. Even today in Dublin he is familiarly known as the Dean. The first line of Swift’s first book, The Battle of the Books, shows, as Damrosch points out, the two elements characteristic of Swift’s important writing: “a probing, ironic, skeptical intelligence” and “a reactionary commitment to an idealized past.” Even so, Swift’s views on everything are the farthest thing from straightforward. He was an Anglican opposed to radical Protestantism, nominal Christianity, and the Church of Rome, but he was an Anglican who despised the Church of England’s founder, Henry VIII. (“I wish he had been flayed, his skin stuffed and hanged on a gibbet, his bulky guts and flesh left to be devoured by birds and beasts for a warning to his successors forever. Amen.”) He was a Tory, and yet he was a tireless social striver who resented the Tory understanding of natural ranks, a system that left him suffering the lot of the nobody when it came to advancement. He disliked the Irish, which is to say the Catholic populace, for their servility and failure to help themselves, yet he was their most vigorous and influential (if anonymous) champion in the Drapier’s Letters and their most scathing, outrageous one in “A Modest Proposal.” He was an exponent of a plain writing style and yet indulged in the most cloying baby talk in his letters to Stella. He was clean in his person and dress, and yet he is the author of some of the most unseemly poems in English — usually called “scatological,” though Damrosch prefers to call them “disgusting” — in which foulness is seen to be the universal truth of humanity. But we can never really know Swift. For some 300 years, different keys and clues — political, religious, psychological, textual, and contextual — have been employed to spell out his motivations and what precisely he meant in many of his works. If that had ever been possible, which I doubt, it is no longer. In the case of Swift’s more oblique works — and I am thinking most particularly of Gulliver’s fourth journey — the language and the worldview of the early eighteenth century are simply too alien to be accessible to us in their every nuance. Some people would disagree with this: perhaps Damrosch himself would, for he is scrupulous in noting the changed meaning of words and otherwise putting his younger (or less historically minded) readers in the picture. But even if language were not the problem, the most important of Swift’s works are so thoroughly imbued with irony that even Swift’s contemporaries were, often enough, not sure what to make of them. One such called Swift “my hieroglyphic friend.” And that’s fine with me. Let the mystery continue, the interpretations and speculations flourish, and the greatest ironist in the English language continue to be read and puzzled over. Previous Previous Post: "Yes, the President's Shot"